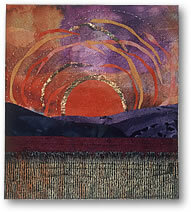 I have been making quilts and hangings for 30 years. I developed my idea of framing miniature landscapes in 1981 and I have been teaching landscape classes since 1984. 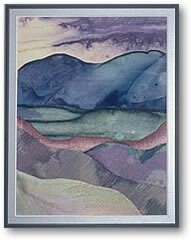 My book 'Beyond the Horizon:Small Landscape Appliqué (C&T) was published in 1995 and is now out of print. My philosophy is simple: I believe every attempt at creativity is important regardless of the end result. A positive atmosphere in the classroom supports the student's innate creativity. Rather than rely on patterns, my techniques and processes foster a sense of discovery and trust in the student's intuitive design sense. One day. Open to all levels, beginner to advanced. Unleash your creativity in this popular class using my simple 'cut and collage' approach to designing landscapes. Design and hand appliqué a small landscape of your own design. Learn techniques you can apply to larger projects. An inspiring and productive day - and you take home a completed and framed project! All materials supplied. All Hand work. 1 , 2, or 3 day . Willingness to explore free form design. Step outside the grid of traditional patterns and experience the spontaneity of free form collage for a fresh way to look at the design process. Look for design cues within the fabric, and complete several small compositions of your own design. Using mainly fusible appliqué techniques, this workshop appeals to quilters interested in exploring their own imagery in quilts. Second day: Students get into the flow of the new approach learned on day one. New compositions are worked on or a more detailed work is begun. If you've never tried fusible (bonded) appliqué, and are wondering what the excitement is about, this is the class for you! This super-quick, versatile technique opens many creative possibilities. 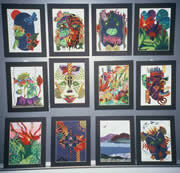 Various products are discussed and you complete and frame an original collage design. Bring only your scissors. Start-up kit contains everything needed to get you up and running for future projects: teflon pressing sheet, iron cleaner, fusible web etc. This is a non-sewing, hands-on class. Completed Project. 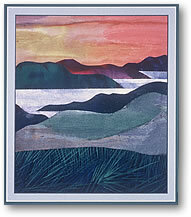 Sunset Fjords 8" x 12"
Two day. Open to all levels, beginner to advanced. The first day is the same as 'Miniature Appliqué Landscapes' where you learn my simple approach to designing unique landscapes approximately 6" x 41/2". Second day: Paint glorious skies to embellish with sheers and stitches. In this relaxing and inspiring workshop you'll complete two framed landscapes. You'll leave bursting with inspiration and have learned techniques that can be applied to other projects. Materials supplied. All hand work. Blazing Glory 5 3/4" x 6"
One day. Beginner to advanced. Create splashy sunsets and subtle sunrises! The emphasis in this workshop is to make a simple landscape of your own design with the focus on a painted and embellished sky. Learn easy fabric painting techniques (disperse dyes) and embellishment techniques such as fusible appliqué, and layering sheer fabrics. Your skyscape will be completed and framed. Materials supplied. All hand-work. A slide presentation celebrating how our quilts are a vibrant expression of our lives and are a vital contribution to the spiritual wealth of our world.. Fascinating, touching and often humorous quilts illustrate our historic and contemporary role as nurturers and creative beings. These quilts speak of a myriad of emotions: peace, healing and abundant joy. This slide presentation covers the development of Valerie's work since 1973 when she began to teach herself the art of patchwork. Quilts and landscapes document the search for her own artistic voice and how living in tropical South Africa, the Arctic and Newfoundland have affected her work.